Not to be confused with The Aftermath (2019 film). Aftermath (originally titled 478) is a 2017 American drama thriller film directed by Elliott Lester and written by Javier Gullón. The film stars Arnold Schwarzenegger, Scoot McNairy, Maggie Grace, and Martin Donovan. The film was released on April 7, 2017 by Lionsgate Premiere. The film is based on events and persons surrounding the 2002 Überlingen mid-air collision of a passenger airliner with a cargo jet, although the names, places, nationalities and incidents were changed. It was released on video on demand. Roman Melnyk, a construction worker, is allowed to leave work early, for the arrival of his wife and pregnant daughter, Olena and Nadiya, from New York City aboard AX 112. At the airport to welcome his family, Roman receives the news that AX 112, with his wife and daughter on board, had been in an accident. From this point, Roman is devastated and blames the air traffic controller for the deaths of his family. Meanwhile, in another angle of the story, Jacob "Jake" Bonanos, an air traffic controller, is happily married to a woman named Christina with whom he has a young son named Samuel. Jake is now also devastated, after seeing AX 112 and the other flight, DH 616, disappear from the radar, showing that the two planes collided and were destroyed. Although the investigators cannot hold Jake responsible for the deaths of the passengers, he blames himself. However, as time passes, he slowly unravels, straining the relationship with his family, and is unwilling to talk about what happened. It is reported that all 271 passengers and crew were killed in the mid-air collision. Roman goes to the crash site and, posing as a normal volunteer, he recovers his daughter's necklace and the bodies of his wife and daughter. At his home, Roman stays hidden inside, when Tessa Gorbett, a journalist, approaches, expressing interest in writing a book on the incident. She ends up leaving behind some prior articles of plane disasters she had written about (to show her credentials as a serious journalist) through the mail slot of the door. Because of the seriousness of the incident, the lawyer advises Jake to move to another state and adopt a new name for the safety of himself and of his family. Roman meets lawyers John and James Gullick to sign an agreement stating that the airport companies will pay for the expenses and damages to his family. Roman refuses to sign it as neither the company nor the lawyers express apologies for the loss of his family. One year later, Roman and the families of the crash victims attend an inauguration of the newly completed memorial at the crash site. Jake, having moved to another site, now works at a travel agency, under the name "Pat Dealbert" and lives alone. Roman has also moved on to another town and now works as a carpenter. Roman meets Tessa and asks her, as a favor, to find Jake. Tessa later reveals Jake's cover name and occupation but she initially refuses to give his address. Roman tracks down the building where Jake is working and follows him to his apartment. There, after waiting a day, on a day when Christina and Samuel happen to be visiting Jake for the weekend, Roman confronts him at his door. Jake refuses to offer an apology, so Roman stabs Jake in the neck. Jake falls to the floor and bleeds to death while Christina and Samuel sob uncontrollably. Roman is convicted of murder and serves a 10-year prison term, then is released on four months' parole. He visits his family's grave where he meets a stranger. The stranger turns out to be a now-grown Samuel, who has tracked Roman down with the intention of killing him to avenge his father's murder. However, Samuel cannot bring himself to kill Roman since it's not what he was taught. Samuel accepts Roman's apology and allows him to leave. On June 23, 2015, it was announced that Arnold Schwarzenegger would star in Javier Gullón's action drama script 478, which would be produced by Darren Aronofsky's Protozoa Pictures. On November 4, 2015, Emmett/Furla/Oasis Films (EFOF) came on board to finance and produce the film along with Protozoa, which Elliott Lester would direct. Lionsgate Premiere would release the film domestically, which would be produced by Protozoa's Aronofsky, Scott Franklin and Eric Watson, and EFOF's Randall Emmett and George Furla, along with Peter Dealbert. In November 2015, Highland Film Group sold the film to different international distributors at the American Film Market. On December 24, 2015, Mariana Klaveno was cast in the film to play Eve Sanders, an airline representative who breaks the news to Roman (played by Schwarzenegger) of his tragic loss. Principal photography on the film began on December 14, 2015, in Columbus, Ohio, previously scheduled to begin on December 6. The film was expected to wrap up in mid-January 2016. The film was released on April 7, 2017. On review aggregator Rotten Tomatoes, the film has an approval rating of 41% based on 49 reviews, with an average score of 5.2/10. On Metacritic, the film has a score of 44 out of 100, based on 13 critics, indicating "mixed or average reviews". Vitaly Kaloyev, upon whose recollection of the actual events the film is based, criticized the film because of some "distortions". According to Kaloyev, unlike the main character of the film, he did not try to seek anybody's pity or apology, but only wanted to achieve justice. In addition, he stated that the real air traffic controller, Nielsen, unlike the air traffic controller portrayed in the film, showed no signs of remorse, but on the contrary, behaved with arrogance and contempt. ^ a b Feran, Tim (November 7, 2015). "Arnold Schwarzenegger's new movie shoots here on Dec. 6". dispatch.com. Retrieved November 11, 2015. ^ "Aftermath". Box Office Mojo. Retrieved April 27, 2017. ^ "AFM: Darren Aronofsky, Arnold Schwarzenegger's '478' Sells Around the World (Exclusive)". The Hollywood Reporter. November 2, 2016. Retrieved October 28, 2016. 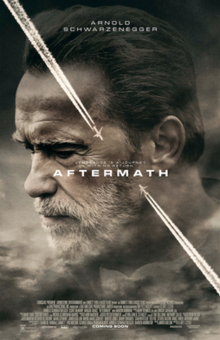 ^ "1st Trailer For 'Aftermath' Starring Arnold Schwarzenegger". VannDigital. Retrieved February 9, 2017. ^ a b Da Costa, Diego (June 24, 2015). "Arnold Schwarzenegger se convertirá en un padre vengativo en el drama '478'" [Arnold Schwarzenegger will become a vengeful father in the drama '478']. ecartelera.com. Retrieved June 23, 2015. ^ Fleming Jr, Mike (June 23, 2015). "Arnold Schwarzenegger Aligns With Javier Gullon Script '478'". Deadline. Retrieved December 31, 2015. ^ a b Fleming Jr, Mike (November 4, 2015). "Emmett/Furla/Oasis & Darren Aronofsky Ready Arnold Schwarzenegger Revenge Drama '478' – AFM". deadline.com. Retrieved November 11, 2015. ^ McClintock, Pamela (November 9, 2015). "AFM 2015: Darren Aronofsky, Arnold Schwarzenegger's '478' Sells Around the World (Exclusive)". The Hollywood Reporter. Retrieved December 31, 2015. ^ Petski, Denise (December 24, 2015). "Mariana Klaveno Joins 'Full Circle' & Schwarzenegger Revenge Drama '478'". Deadline. Retrieved December 31, 2015. ^ THOMPSON, JAQUALINE (December 8, 2015). "The Arnold Movie, 478 starts filiming in Columbus next week". WTTE. Retrieved December 31, 2015. ^ "Arnold Schwarzenegger To Begin Filming Movie In Columbus". wosu.org. November 7, 2015. Retrieved November 11, 2015. ^ Romano, Nick (February 7, 2017). "Arnold Schwarzenegger seeks retribution in Aftermath trailer". Entertainment Weekly. Retrieved February 7, 2017. ^ "Aftermath (2017)". Rotten Tomatoes. Fandango. Retrieved April 17, 2018. ^ "Aftermath Reviews". Metacritic. CBS Interactive. Retrieved July 4, 2017. ^ "Фильм "Последствия" со Шварценеггером разочаровал Виталия Калоева". РИА Новости. 2017-04-17.